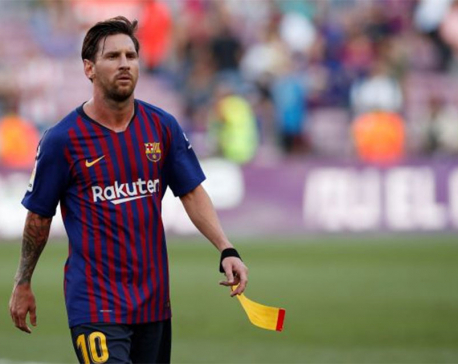 BARCELONA, Oct 21: Barcelona snapped a four-match winless run in La Liga with a 4-2 home victory over title rivals Sevilla on Saturday to reclaim top spot but the triumph was marred by talisman Lionel Messi fracturing his arm and being ruled out for three weeks. 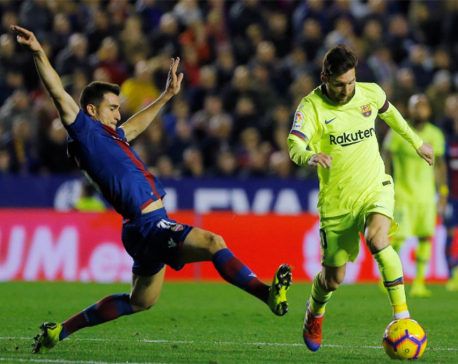 A club statement revealed the forward had suffered a fracture, ruling him out of five games in La Liga and the Champions League, most crucially next Sunday’s ‘Clasico’ at home to arch rivals Real Madrid as well as both games against Inter Milan. “It’s a considerable loss,” said Barca coach Ernesto Valverde of the injury to his club’s all-time top scorer and captain. Sevilla midfielder Pablo Sarabia pulled a goal back for the visitors soon after, helped by a heavy deflection from Barca defender Clement Lenglet, only for former Sevilla skipper Ivan Rakitic to score Barca’s fourth, declining to celebrate the strike against his former club.